SmartCPA is an auto-optimized algorithm that adjusts the parameters of your advertising campaign with a CPA bidding model to help you get as many conversions as possible. It uses advanced machine learning to automatically match your CPA offer with users that are interested in such content. Before launching a working CPA campaign, our system will test it. The test period will show whether your campaign is effective with the targetings you’ve chosen. When the test is over, you see the results and statistics on the "Dashboard" page in the "Campaign" tab. Also, you can find current status of SmartCPA campaign on the "Campaigns" page. How does a SmartCPA campaign work? You create a new SmartCPA campaign. The campaign is approved by our Policy Team. It starts running for a test period. After the test, you get an optimized campaign with a CPA pricing model. How to launch a SmartCPA Campaign? 1) Log in to your advertiser account and go to the "Campaigns" page. 2) Click the "Create Campaign" button. You’ll see the menu with general information about your new campaign. 3) Enter your Campaign Name and choose SmartCPA as the pricing model. To start a SmartCPA campaign, you should first set up conversion tracking. Read here how to set up conversion tracking properly. This is the landing page (or URL provided by a third party system like Voluum or AdsBridge) that the user will be directed to. You can choose GEO using our presets or enter names of countries manually by typing them in the form. You can add Conversion Price for each GEO separately. Amount of money you are planning to pay us for getting one conversion. Based on our experience, we recommend setting 70-80% of your CPA network’s payout. This will speed up the process of finding the most relevant traffic sources. Example: Your CPA network’s payout is $3.00 and you want to set the conversion price for your SmartCPA campaign. As we recommend setting at least 70-80% of your payout at the beginning, the best choice for conversion price should be around $2.50. 6) Fill in the details about your campaign's Budget. These settings are very important, so please read our recommendations thoroughly! Amount of money you’re willing to spend per day on this campaign. If your campaign runs out of its daily campaign budget, it stops. We DO NOT RECOMMEND setting a Daily Campaign Budget. Amount of money you are planning to spend on this campaign for the entire working period (not including the Test Budget). If your campaign runs out of its total campaign budget, it stops. We DO NOT RECOMMEND setting a Total Campaign Budget until the test period is over. Please make sure you have enough funds in your balance to cover the Total Campaign Budget + Test Budget Limit. Otherwise your campaign may be stopped due to a lack of funds and testing will not be completed! Note: The Daily Campaign Budget should be more than $10. The Total Campaign Budget should be more than $100. You can set the running period manually using the calendar or choose one of our presets: weekdays only or weekends only. By default, the campaign has no End Date. If you want to set an End Date, check "Set display period". We DO NOT RECOMMEND setting End Date for SmartCPA campaign. If your campaign will be stopped by scheduler during the test period you will have need to create new SmartCPA campaign to continue testing this offer. 8) Learn your audience and target your campaign properly so it will work cost effectively. You can use Simple targeting mode or switch to Advanced. These settings are very important, so please read our recommendations thoroughly. Amount of money you should be ready to spend entirely on testing. To start smart CPA test you need to have at least $150 available on your balance (including $50 as a test price and $100 to pay for conversions). How big should the Test Budget Limit be? The bigger the budget you set, the more zones (ad placements) will be tested for the chosen targetings. Our optimization algorithms will take some time to gather enough data and find the most relevant traffic for your offer. In other words, the bigger your Test Budget Limit, the more traffic you’ll get. “Slice Limit” is a maximum number of ad impressions for desktop & mobile users you want to test per 1 ad zone per 1 GEO. This is made for you not to spend all the test budget on zones with huge amount of traffic. Example: you’ve set a limit "1000 impressions per slice". If test campaign reaches this limit and the zone is providing good conversion rate, your SmartCPA campaign will get traffic from this zone above the limit. If conversion rate is not good enough - our optimization system will go to the next zone with new 1k impressions limit. Default limits are suitable for most campaigns, but if you are an advanced user and want to test more different zones within your budget - you may decrease the limits. 10) After you’ve filled in the forms and set the targetings, click "Save and Start". Don't forget to read the Quality Guidelines. The campaign’s test will be launched immediately after passing moderation. 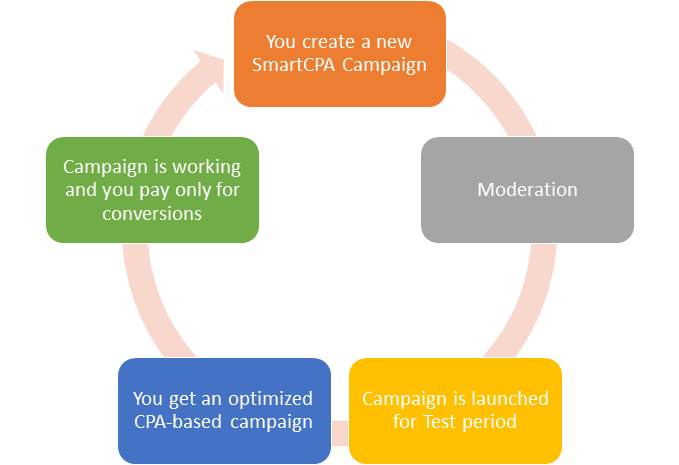 How does the SmartCPA Campaign work during the test period? After approval, your SmartCPA campaign will be active with "Testing" status (a rocket symbol). You can find it on the "Campaigns" page. 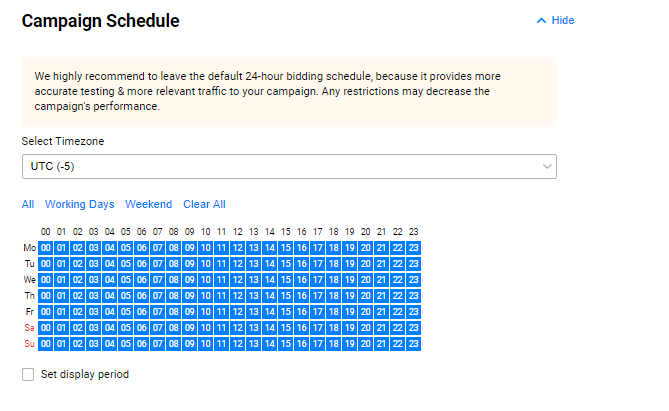 During the test, our optimization algorithms find the most relevant traffic (and zones) for your offer. Keep in mind that our system needs time to test your offer, so the longer the test runs, the more effective it will be. Please note: We DO NOT RECOMMEND stopping or editing your SmartCPA campaign during the test period. Once our algorithms have started working with the settings and targetings you’ve applied, they should not be changed until the test has ended. Even if you decide to continue with the same offer, you will need to create a new SmartCPA campaign! My campaign’s test period is over. What’s next? Congratulations! Your offer is converting well. Your campaign has passed the test period, and it can continue running with the CPA pricing model as long as you need. From now you’ll be charged only for completed conversions. Unfortunately there were not enough conversions during the test; your campaign was not effective and was stopped by our system to prevent you from losing money. You will only have to cover the Optimization Costs. If your campaign wasn’t effective enough, we will ask you to cover the cost of traffic that was used for testing. But if your campaign converted really well during the test, you will pay only for completed conversions. If total revenue from your conversions (= 'Conversion Price' * 'Amount of conversions') is less than cost of impressions generated for test, then the difference will be charged from your Test Budget. In other words, the better your offer converts, the less optimization costs you need to pay. Q: My SmartCPA campaign test failed (ended with "Stopped: not effective"). Why did it fail, and how should I optimize? You’ve chosen the wrong CPA offer. We recommend starting with sweepstakes, pin/zip submits, or mobile utilities. You don’t use a landing page, or your landing page is not well optimized. Conversion tracking is not configured properly. Please read how to set it up. You’ve set the conversion price too low. If you are running your first SmartCPA campaign (or testing a new offer), we recommend setting it to at least 70-80% of your CPA offer payout. Targetings are too wide or incorrect. We recommend launching separate campaigns at least for each GEO and Platform. Sending desktop and mobile traffic to the same landing page will decrease the conversion rate. Q: Why did my SmartCPA campaign stop? Your campaign reached the "Total Campaign Budget". You don’t have enough funds in your account to continue. Campaign has reached its "End Date" (set under Campaign Schedule).